EXPLORE THE HISTORY OF AMON! AMON! The Ultimate Texan is the story of one of the most amazing Texans whoever lived. Born in a log cabin and with only an eighth grade education, Amon G. Carter Sr. became Texas’ most powerful media overlord. Presidents put up with him because he owned the largest newspaper, radio and television station in Texas. He had a big heart, but a bigger sense for business and for the future. He was one of a kind and this play – and its companion book – by popular newspaper columnist Dave Lieber bring the story of this remarkable Texan back to life. DAVE LIEBER has worked as a Texas newspaper columnist for more than 25 years – first at the Fort Worth Star-Telegram and now at The Dallas Morning News where he writes the twice-weekly investigative “Watchdog” column. The author of eight books, Dave is also a certified professional speaker, one of only a thousand in the world. He specializes in teaching strategic storytelling to businesses, groups and individuals. AMON! The Ultimate Texan is his first play. His latest columns are available on The Dallas Morning News Watchdog page. He fights for Americans and shows them how to save time, money and aggravation. He works to expose corruption and make positive change. TheDailyBeast.com named of his columns one of the 10 best in the U.S. in 2014. Motivational speaker Dave Lieber is one of America's top storytelling experts for businesses. He quickly trains your team on how to jump to the next skill level with humor and fun. Dave Lieber. 's new play about Amon Carter Sr., one of the most consequential figures of the early 20th century in Texas, will have its world debut at Artisan Center Theater in Hurst in May. Tickets now on sale. When Amon G. Carter Sr. visited Ireland, he was hailed as “the mighty Carter, son of the Lone Star State.” Quite fitting. Texas is what it is today – a leader in industry, especially aviation – in part because of the work Carter did in the first half of the 20th century. A one-man economic development department for Fort Worth and vast West Texas, Carter is credited with luring a trillion dollars’ worth of businesses to his beloved state. Flashy, excessive, impulsive and powerful, the pretend-cowboy manipulated presidents with gifts and hobnobbed with celebrities. At every turn, he fought arch-rival Dallas. Legend has it that he carried a sack lunch to Big D because he didn’t want to spend any money there. Flashy, excessive, impulsive and powerful, the pretend-cowboy manipulated presidents with gifts and hobnobbed with celebrities. At every turn, he fought arch-rival Dallas. 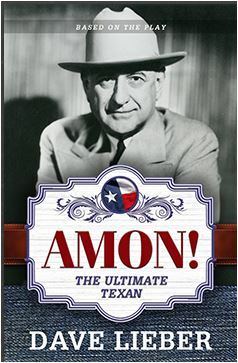 In this book, a companion to the new theatrical production of the same name, Amon Carter tells how he built one of the great media empires of the land – and what he did with it. The book also presents 100 classic photographs from the era that bring Amon’s words to life.